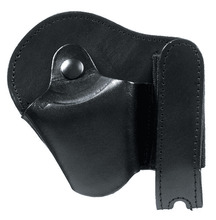 The ASP Combo Case will hold one pair of chain or hinged handcuffs and one baton or flashlight. The case includes a hidden pouch for an extra key (included). Great for plainclothes, investigators or security. The attachment to your belt is doubled to allow each snap to be on the other side of a belt loop. This will help maintain the combo case's position on your belt.